Our Travel Teams are competitive in the Western New York region and beyond. Players will be pushed to improve skills while maintaining a love for this sport. If your child has ambitions of high school hockey or beyond, this is the program for him or her. WYHA Travel Teams at the U12, U14, U16, and U18 levels may elect to be "Tournament Bound" (TB), i.e. to compete for the chance to attend the New York State Championships at the Tier II level (or AA) in March with the possibility of qualifying for the National Championships in April. Tryouts for Travel Teams occur in late March (9U, 10U, 11U, 12U) and April (13U, 14U, 15U, 16U, 18U) every year. The Youth Travel season begins on 8/1 and ends the day after all State Championships complete in March (9U, 10U, 11U) and the day after the National Championships end in April for 12U thru 18U teams. 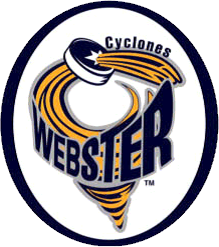 Our primary rink is Webster Ice Arena in Webster, NY. Teams may practice or play home games at other Rochester area rinks if ice is not available at the Webster Ice Arena. Travel teams play in the WNYAHL league with home and away games against teams in their WNYAHL division which may include teams from northwestern PA, the Southern Tier, Rochester, Buffalo or Syracuse. Two practices a week depending on age level. In addition, there will be opportunities for both on ice clinics and off ice training. WYHA Travel teams (9U to 14U) typically play from 30 to 50 games per season (August to February). 15U, 16U and 18U Midget teams generally play a split season 20 to 25 game schedule from August to early November and then shut down so players may participate in the High School season. Midget teams may re-form to practice or play Tournaments in late February and March at additional cost. Players new to Webster or who have outgrown their jerseys must purchase home and away jerseys at an additional cost. Ordering of Travel jerseys occurs in May every year. Tournaments, extra ice time. team events and team wear are not included in registration costs. Parents should expect to discuss the locations and costs for these activities at the initial parent meeting with their team's coach. This program is closed. Please contact the appropriate Travel Coach for openings. The list of Travel Coach names and email addresses can be found under the ORGANIZATION tab above. If the Travel Coach is interested in adding another player then he can contact the Registrar to have this registration re-opened! $150 Payment at Tryouts NOTE: All fees in this registration assume $150 was paid at Travel Tryouts. Players who did not pay this fee by May 31 should the check option "I have not paid the $150" and $150 will be added to their fee. Use the Registration below to register those players who were selected for a WYHA Travel Team (other Programs have separate registrations).